The M4 carbine is extensively used by the United States Armed Forces and is largely replacing the M16 rifle in United States Army and United States Marine Corps combat units as the primary infantry weapon and service rifle. The M4 is also capable of mounting the M203 and M320 grenade launchers. The distinctive step in its barrel is for mounting the M203 with the standard hardware. 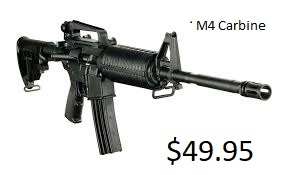 The M4 is capable of firing in semi-automatic and three-round burst modes (like the M16A2 and M16A4), while the M4A1 is capable of firing in semi-automatic and fully automatic modes (like the M16A1 and M16A3).